Extract from the workshop’s report. The drawing shows a proposition for enhancing an open space in Khotachiwadi. This Khotachiwadi emblem was produced by one of the workshop participants. The wall on which it hangs is now a busy selfie spot. On the last day of the workshop the output was shown at various locations in Khotachiwadi. A staircase linking up two chawls through back-alleys, which was built during the workshop. We have been busy in one of our favourite neighbourhoods! Khotachiwadi embodies many of the contradictions of Mumbai. It is beautiful and decaying at once. It is full of life, but also slowly disappearing. Its residents don’t know how to cope with the many challenges that the city throws at them: from inadequate infrastructure to aggressive speculative takeover. 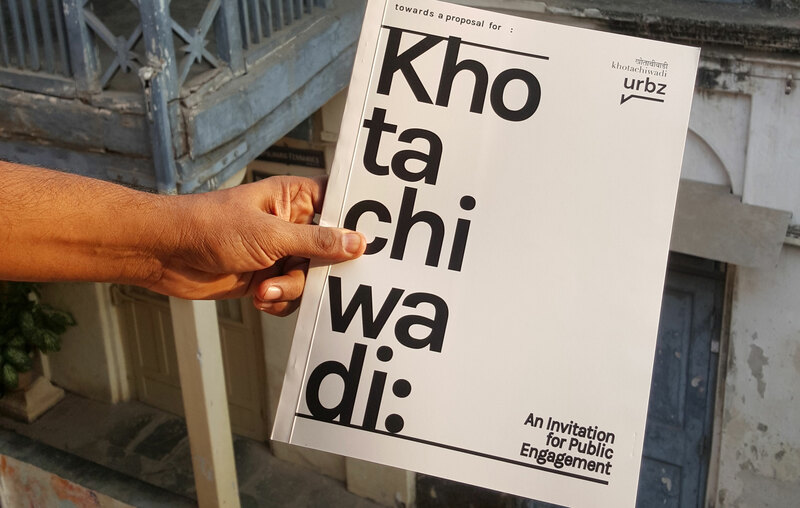 urbz just produced a pre-proposal for a more pro-active engagement by the residents and the city at large in the transformation and preservation of Khotachiwadi. The proposal was presented to the residents on the last day of a design workshop that we organized between January 7th to 10th, 2016 in Khotachiwadi with ARA, a group of Berlin based architects. The workshop was open to participants interested in Khotachiwadi and what it represents for Mumbai. The workshop’s premise was that heritage conservation is important, especially in a place like Khotachiwadi that reflects the city’s history. However, in Khotachiwadi, preservation goes together with transformation. What needs to be preserved more than anything is the residents’ sense of engagement with their neighbourhood. In the workshop, every participant focused on a specific location or element of Khotachiwadi. They analysed the elements graphically, interacting with people who used them, and then re-imagined how it could evolve over time. Participants generated ideas for how to creatively use, transform, and activate Khotachiwadi. The final output was a mix of very diverse representations of the neighbourhood and its possible futures, which were framed and exhibited in the street, providing an opportunity for further interactions with residents, visitors and people passing by. 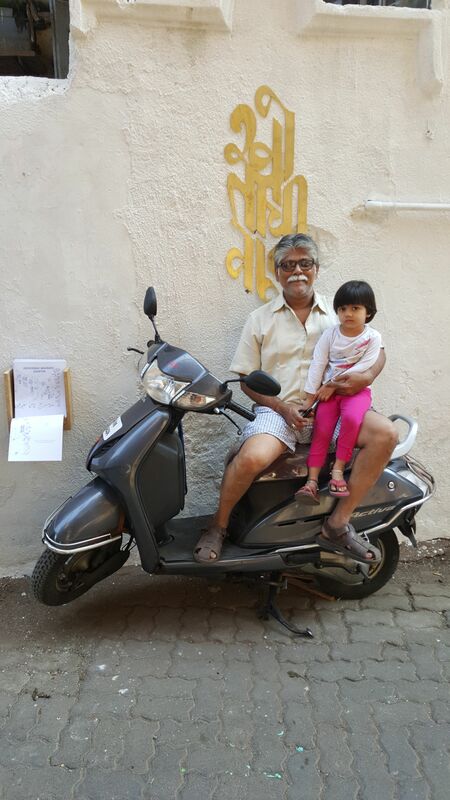 The Khotachiwadi Imaginaries workshop was followed by a two week-long exhibition in the neighbourhood. On the first day, a map of Khotachiwadi was painted on the wall at the entrance, which was itself transformed into an exhibition space. Next to the map, a large emblem in copper, designed by one of the participants, was nailed onto the wall. It reads “Khotachiwadi” in Marathi. Walls were whitewashed in various parts of the neighbourhoods, alleys were cleaned, stationary motorbikes were adorned with masks, an open space was transformed into a pop-up tea salon with new benches and flowers, an old abandoned car was turned into a flowerpot, architectural drawings were framed and put onto compound walls, and games were organised for the kids. Some participants spray painted pictures of cats onto alley-walls with local children. 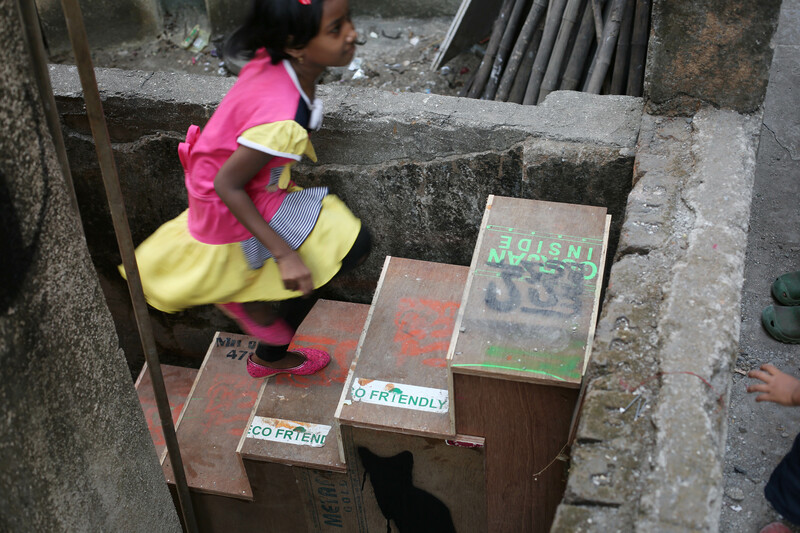 One group built a sturdy, wooden step-board to help children cross over from one chawl into another. We were informed by the residents themselves that some of them interacted with each other for the first time in spite of having lived next to each other for years. Kids particularly enjoyed getting together to paint and play games. 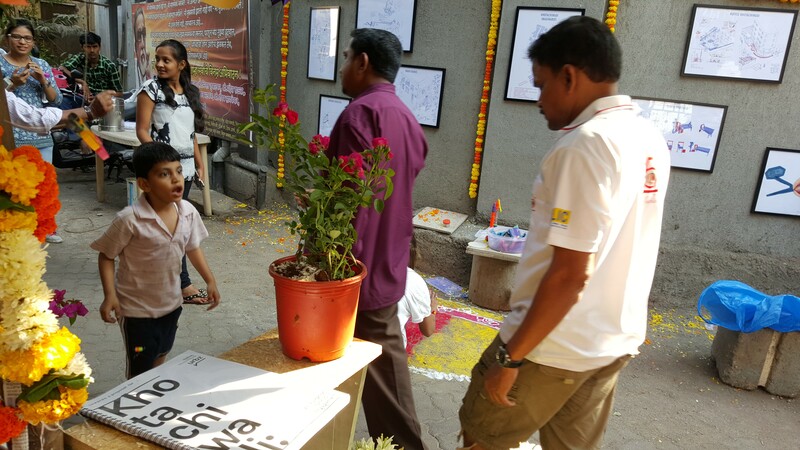 Children, youth, adults and elderly residents from Khotachiwadi, as well as passers-by from the main road, all came in to look at the designs and ideas, and interacted with the workshop participants. The exhibition was held at three main points in the neighbourhood: the entrance near Girgaum Church, the back wall of Girgaum Lodge, and the gate outside Ideal Wafers. All three of these are existing points of high interaction and activity, and the exhibition made it all the more exciting. Over two weeks after the exhibition day, the frames are still hanging on the streets of Khotachiwadi, not because the organisers forgot to remove them, but because we were asked to leave the exhibition up a little longer! Download urbz’ Khotachiwadi proposal here: http://urbanlab.org/khotachiwadi/Proposal_Jan2016_web.pdf (and here for the printable version). 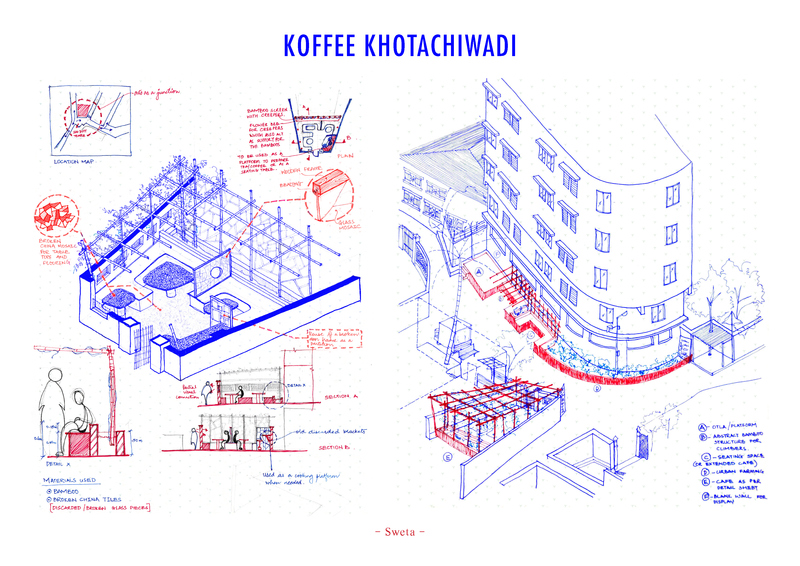 Download the Khotachiwadi Imaginarines workshop report here: http://urbanlab.org/khotachiwadi/Imaginaries_Workshop_Jan2016_web.pdf (and here for the printable version).